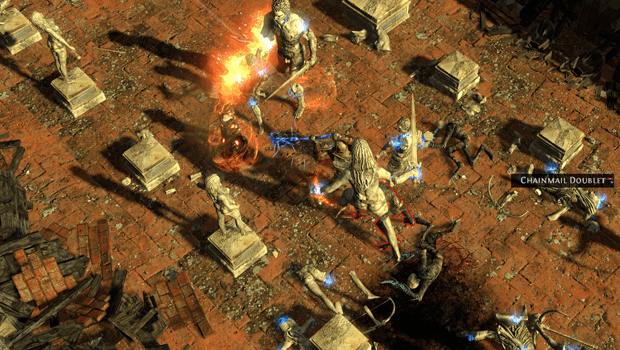 Path of Exile has received a patch today, deploying version 0.10.1 of this free-to-play Diablo-style dungeon crawler. Some bug fixes, some balance changes, but the bulk of the meat here comes in the form of 11 new map types for end-game map generation, and a good amount of aesthetic content updates. By the way, if you’re looking for an experience akin to Diablo III or Torchlight II that’s free to play, I really suggest giving this one a shot – for a game that’s still technically in beta, it’s a tremendous amount of fun, especially with friends. Patch details below. Improved all of the Duelist’s animations. The Unique bow Death’s Harp now has a particle effect for its custom art. Pressing the alt (or highlight) key in trade while hovering an item now says “item level” rather than “level” to make it clearer. Renamed “Angel Kite Shield” to “Angelic Kite Shield”. Stun Threshold Reduction now has diminishing returns when it exceeds 75%. It’s still possible to build very effective stun characters, but they cannot permanently lock down the hardest of bosses.